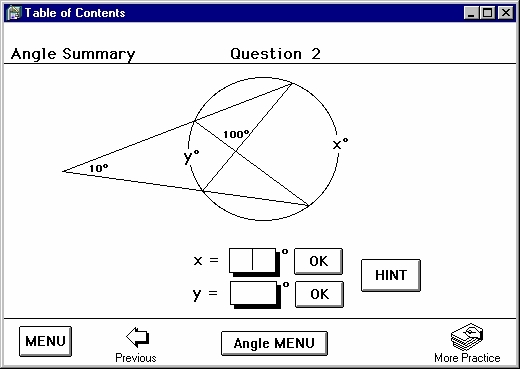 This program teaches the student how to calculate the measures of the chords, arcs, angles (central, inscribed, chord-tangent, chord-chord, secant-secant, secant-tangent, tangent-tangent), common tangent length and inscribed quadrilaterals. The topic of "Circles" in high school geometry is one of the most challenging. There are over 50 theorems and definitions to learn about "Circles" and the topic is a very favorite of college placement exams such as the S.A.T. and A.C.T.